So, it appears February has arrived, as has the week of my NN Residency alongside my fellow students from the University of Northampton. I shall be taking a break from all comic and other projects business to create my tent/lavvu, and then proceed to hide in it when times of extreme stress arise. As of today, we’re collectively gracing Northampton town centre with our talents and wit at the NN contemporary project space and gallery on Guildhall Road. Different things are going on each day, and if you’re local to the area you should definitely pop round and pay us all a visit. As I’m in all day tomorrow, I’ve taken some time to make sure I get the basics of my structure prepared today to avoid any unsightly setbacks.. As, you know, I’ve never made a Sámi lavvu before. I know what you’re thinking: who HASN’T made a lavvu?! Although I may well be behind the times I’m using my highly refined organisational skills and coloured markers to be able to recreate the structure in situ at the project space tomorrow, and have my measurements and calculations ready to cut out my fabric for the inner and outer shell. Exciting! Although I mentioned it before, thanks to my wonderful parents for collecting sticks out of their garden for me and helping with the fabric, otherwise I may have been arrested by now for chopping off branches at the local park with a bread knife. As I mentioned last week, this lavvu I’m creating is related to my upcoming comic release, so far with the name under-wraps and being referred to solely as The Next Big Thing (not in an egotistical way, in a ‘this is MY next big thing to come out’ way, just to clarify that I’m not an uppity plonker). Progress has been going well, and with my schedule set for the next two months I’ll be drawing at least 4 pages per week alongside other final projects for my degree. Busy, busy! I completed my six prelude pages last week and later on today I’ll be continuing progress on pages 7-10, with the hope of making a head start on the next four too. Things are really starting to get moving, and in the coming weeks I’ll be announcing my fundraising campaign for the project! I’m not sure how aware people are or not, but smaller print runs are cheaper initially, but in the long term far more expensive than getting a bigger print run to begin with. For The Red Road I tentatively printed 100 and ran out in 9 months, meaning my costs were far more than they needed to be – whoops! This time, I’m learning from my errors and planning to create The Next Big Thing in a print run of 250 copies. Unfortunately for me, it’s going to be a rather expensive venture, and after some umm-ing and ahh-ing I decided my best course of action is to crowd-fund the total online. This means I’ll be offering not only an option for the book, but also prints, originals and other limited edition goodies that won’t be available after the release in Spring/Summer of this year. So, keep an eye out for my announcement on this soooon… On here, on Facebook, Twitter, all the usual channels! 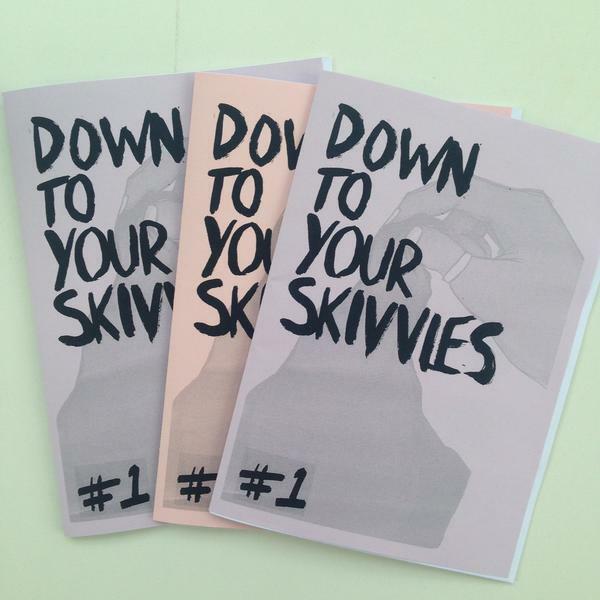 Finally, in very exciting news Down to Your Skivvies Issue #2 has been printed and is almost ready to go! In case you missed it last week, DTYS is being launched this coming Saturday 6th February at the NN Project Space from 4-6pm in Northampton, so come on down and say hello if you’re out and about! This issue is all about writing, writers and the arts, and we have some very special work in there including an interview from a lovely talented gentleman and a short story from a skilled friend of mine currently studying in Liverpool. Crossing the north/south divide one zine at a time! Here’s a sneaky view of the pile of paper I have yet to fold and staple, with the front cover and font designed by yours truly. DTYS #2 will be available to purchase online from Monday 8th February from both Zara’s and my online Etsy shops. I think that’s about it for now! I’d best get back to my fabric trimming business, which is quite a nice change from the usual work of being stooped over a desk for hours on end. Now I’m stooped over fabric, huzzah! I shall be back next week with more updates from The Next Big Thing and some lovely launch photos from Saturday afternoon at Skivvies. And hopefully a successful lavvu! Until next time.. HAPPY NEW YEAR! I trust everyone had a wonderful New Years Eve, as I did, though I hope all your New Years Days weren’t spent recovering quite as ungracefully as mine was. Somehow I managed to forget that I spend my life at a desk and barely ever drink, though an unappreciated two-day hangover reminded me.. New years resolution: party more than twice a year? So, I’ve bobbed up to the surface from the depths of my dissertation to bring you all some wonderfully exciting news.. Down to Your Skivvies is back! At the end of this month, pending any hiccups, us Skivvies ladies – Zara Ward, Kamala Roberts and myself – will be releasing issue two of our illustration/comics/arts zine Down to Your Skivvies. The first issue was released back in April 2015, with an unplanned gap between issues purely down to University workload and summer vanishing before our eyes. However, we’re now back with issue two which will be better than ever! Here’s some of the bits I’ve been working on so far.. I really enjoyed working on Skivvies the last time; there’s something more relaxed and open about creating a DIY zine, printing and stapling it yourself for distribution compared to the highly detailed and often time consuming work of putting a comic book together. We have some great things lined up for Down to Your Skivvies #2, and with our theme of WRITERS, there’s plenty to get stuck into! As you can see from above we have short stories, a comic, bookmarks and even a very special guest interviewee, illustrated poems and lyrics, and more! As us ladies have all been off over the Christmas break we’re yet to have a date of release, but it’ll be around the end of January – as soon as I know, you’ll know! As before, DTYS will be available in person and online via my Etsy store. In other news, as you may remember from a month ago with my announcement regarding Laydeez do Comics and Broken Frontier, on Monday 18th January I’ll be speaking alongside Broken Frontier’s Editor-in-Chief Andy Oliver and Danny Noble of “Was it.. Too Much For You?” fame. Held at Gosh! Comics in London, I touched upon the great work Laydeez do Comics do and my involvement to date in my blog last month and also announced that I’d be painting the Gosh! windows in readiness for the event. That time is almost here! This week I’ll be making my merry way down to the Big Smoke to draw on some windows and try not to eyeball the people of Soho, which is probably easier said than done. I’m really, really excited to have been given the go-ahead for this project – it’ll be my first time drawing on window’s and I’m excited to see the results! Hopefully it’ll draw some extra interest for Laydeez do Comics, and act as something nice to entice more people into Gosh. As I’m working on this as a part of a university assignment I will be documenting it fully, so expect lots of photos next week! Speaking of the Laydeez do Comics evening, tickets went on sale on the 30th December and sold out in an incredible 24 hours! I guess that means the pressure is on to pretend that I’m actually interesting. My 15 minute slot is an exciting yet daunting thing..
I’ve been trying really hard (as my tutors keep telling me to) to break out and try different materials and way of working, so I’m using this time to play about with how I’m working and develop the characters a lot further than I’ve ever developed for comics before. It’s a new and definitely worthwhile practice for me, and I’m so excited to see what comes in the process of working towards the final 40-page work of wonder – hopefully not too many paper-cuts, sweat and tears. Unfortunately, for now I must return to the joys of dissertation writing. Thankfully my degree is largely practical (you’d hope so, being an Illustration course), which means my dissertation is only 5’000 words – however that doesn’t make it particularly easier. Next week I shall be back with a next-to-finished dissertation, painted windows at Gosh! and looking forward to the Laydeez do Comics evening.. Until next time! Good morning you lovely people, you! So, it appears to be autumn. I’m not quite warm enough, University is looming once more and my list of jobs to do before third year starts is slowing depleting.. Though I keep thinking of things to add to it, which doesn’t help. Thankfully, stress is low and my stocks of camomile tea are high, so here’s to a good few weeks before the teeth-grinding, alcohol comforted, crying into sketchbooks era of Third Year begins. Amongst the delights of laughing at my own history of terrible drawings last week, and celebrating the wonders of MancsterCon, you may have seen mentions of the Top Secret Project having reached completion. Now, the Top Secret Project started back around May, though it still feels like a blur of thinking and drawing, with the final painting of my 10 pages taking a week to complete. I still can’t divulge any more details about the Top Secret Project (in case you hadn’t already guessed from the title), but if you can all hold onto your hats for just a couple more months, all will be revealed… For now, though, here are some of the final images; from final inks to varying stages of painted completion. I’m still resting in that uncomfortable zone of “is-this-actually-terrible-and-people-will-laugh-at-me-and-I’ll-have-to-change-my-name-and-become-a-hand-model-and-move-to-a-village-and-hide-forever”, but I’ve come to realise that the fears and worries are a good thing. Emotional investment equals fear of other peoples opinions, and emotional investment means I’ve done the best I can. So, let’s just hope it’s not a flop. Similarly to The Red Road, I drew all my pages out in pencil, went over them in fancy ink pen, and painted them in varying shades of gouache. Unlike The Red Road, however, I drew everything 100% larger than it’s due to be printed; it’s something my lecturers at University kept telling me I should do to improve my figure drawing, and I actually listened. I’ve been drawing double the size of print since Rejsen, with my comic in Sneaky Business also being double the size of print too. I’m not sure if it’s making me a better illustrator/artist or not, but it works well enough and doesn’t take any extra time. The one thing I did do different this time, is that I worked on all the pages from rough form on separate paper first, then once the pencils were done-ish I used the light-box to draw everything up on the final fancy paper in pencil again, tightened it all up and inked. The good thing about doing it like this, is that the paper wasn’t left with a multitude of rubbed-out mistakes, and no pencil indents too. I IS LEARNING, LIKE. But yes, with every new project comes a new set of wisdom, and the completion of the Top Secret Project has left me feeling comfortable in the set of processes I have for my upcoming Final Major Project at University (cue: fear). Last week also saw the review of Down to Your Skivvies #1, by Broken Frontier in Andy Oliver’s new Zinewatch feature! DTYS#1, created by Kamala Roberts, Zara Ward and myself earlier in the year is about celebrating women in the arts, and though #2 is in the making, it’s great to have a little boost with this review – thanks Andy! You can read his review of DTYS here, and purchase a copy on Etsy, here. Old school zine-style in presentation, Down to Your Skivvies! is an eclectic mix of material that, nevertheless, retains a consistent thematic approach and voice. – Andy Oliver, Broken Frontier. Aside from this, the past week has actually been pretty busy with non-work related things, although a couple of lovely new shiny projects have come my way which will give me plenty to do this week, along with that damn pre-uni, ever growing check-list. So, I shall leave you all rest-assured that I am continuing my delicate balance of staying warm, drawing lots, and doing my very best not to go into hibernation mode. I am off on a few day escape to Amsterdam next week so I will be back with my blog on Friday instead of it’s usual mid-week presence, but picture me happily cycling around canals in the rain whilst stuffing my face full of poffertjes and wheels of gouda. Until next week!